The mass graves along our Malaysian borders is a wake up call for urgent action against human trade syndicates. It is an open secret that many Rohingya die at sea, fleeing persecution in Myanmar by taking risks with human traffickers. The discovery of mass graves near Perlis, on the Malaysia/Thailand border further entrenches the fact that trafficking is rampant and ongoing. This leaves Asean member countries with no choice but to act now, without delay. Firstly it needs to come up with an Asean declaration or pact, which looks into trafficking seriously and churns out lasting solutions or at the very least strategies that move in the direction of finding those solutions. This involves looking into sensitive issues such as state-sponsored violence against the Rohingya; Myanmar’s record of gross violations of human rights; the absolute power still vested in the hands of the military; and the lack of political will by the quasi-civilian government to stop the ongoing violence against the minority Rohingya community, described by the United Nations as the world’s most persecuted people. For this to happen Asean must re-look its ancient, archaic and redundant non-interference policy, which again, only goes to safeguard one member country against the other. Non-interference here is to remind each member country to stop looking the other way. This spineless cowardice earns each member country the same favour, even if it is indulging in persecuting a group of vulnerable people who are stateless in their own land. The ongoing violence inflicted on the Rohingya is no more a domestically contained problem. It has already spilled over into other countries. In fact it has, for many years now. The rotting bodies in the camp found in Northern Malaysia bear testimony to this. I am heartened to note that former Prime Minister, Abdullah Ahmad Badawi, together with ex-cabinet ministers issued a statement about Asean’s need to look at the plight of Rohingya during the recently concluded Asean Peoples’ Forum. It is also laudable that Malaysia’s Foreign Minister, Anifah Aman, raised the Rohingya issue at the Asean summit. However, these initiatives are not enough. 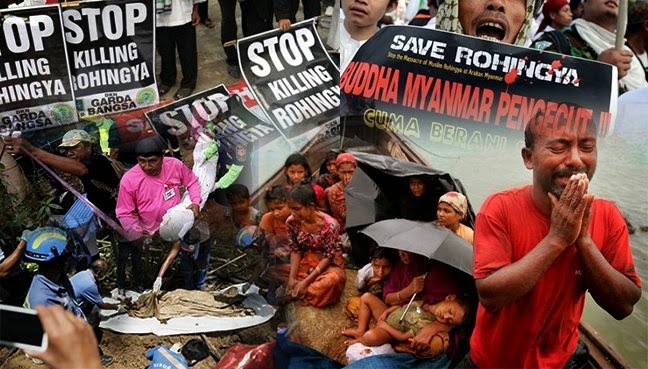 Malaysia needs to keep up the pressure as there are also concerns about an escalation of violence against the Rohingya and other Muslim communities in the run up to the elections in November this year. As the Chair of Asean, Malaysia is in a good position to moot the idea of an Asean declaration that looks into trafficking of all vulnerable communities, and especially the Rohingya, in this region. Asean can and should work together with regional organisations that are already working on issues of trafficking to come up with a comprehensive, workable and durable strategic plan. As a first step towards establishing a region wide declaration on anti-trafficking, Malaysia must accept the urgent call for a meeting between Malaysia, Myanmar and Thailand to address the on-going trafficking and refugee issues involving the three nations. Either that, or the Rohingya and other groups of vulnerable people will continue becoming victims of trafficking syndicates. They will continue to be nothing but just bodies for sale. Charles Santiago is the Member of Parliament for Klang.